The DiamonDuo Bracelet is made using Herringbone Stitch and the DiamonDuo beads add gorgeous texture. 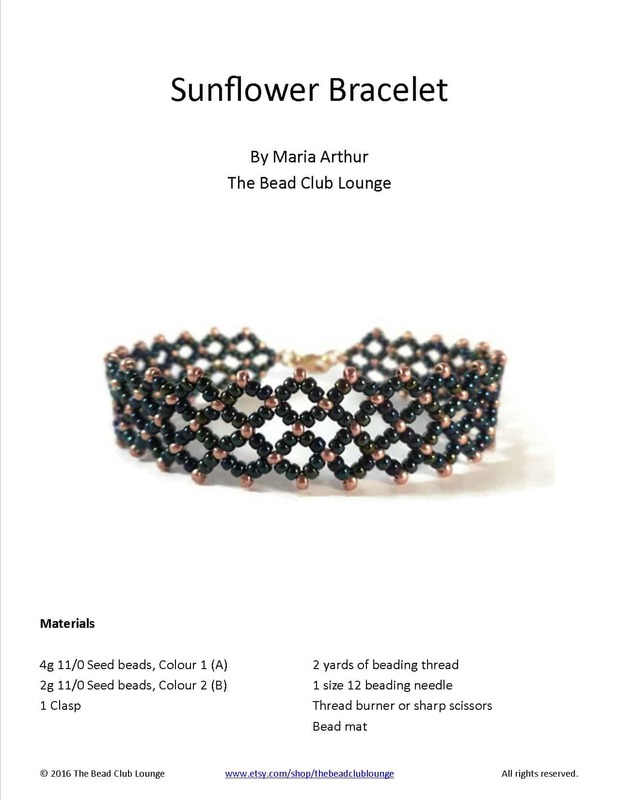 Accentuate the edges of the bracelet with a combination of size 11 and size 8 seed beads. I would recommend this bracelet tutorial for all skill levels. Below is the materials list. Click any of the links to purchase the supplies required for this project. You can also check out my Amazon store to see the beading supplies I recommend. Step 1: Thread your needle with 2.5 yards of beading thread. Leaving a 10-inch tail, attach a stop bead. Step 2: String 2A, 1C, 1D, 1C, 2B, 1C, 1D, 1C and 2A. Note: DiamonDuo beads have a faceted side and a flat side. Be sure to string all of them so the faceted side is facing the same direction. Step 3: String 1C, 1D, 1C and pass through the second hole of the last 1A strung. Step 4: String 2A and go through the second holes of the next 1A and 1B. Step 5: String 2B and pass through the second holes of the following 1B and 1A. Step 6: String 2A and pass through the second hole of the next 1A. Step 7: String 1C, 1D and 1C. Then, go through the second hole of the last 1A just added. Step 8: Repeat Steps 4-7 until you have reached your desired bracelet length. Step 9: String 1C, 1D, 1C and pass through the second holes of the following 1A and 1B. Step 10: Repeat Step 9 once more. Then, string 1C, 1D, 1C and go through the second hole of the final 1A. Step 11: Weave the working thread through the beadwork until you exit the centre 1D in the final row. Note: Make sure you follow the thread path of the bracelet. Step 12: String 3C and one half of your clasp. Step 13: Go back through the last 1C strung. Step 14: String 2C. Go through the 1D you originally exited in Step 11 from the side opposite where the working thread is exiting. Weave the thread into the beadwork. Tie several half-hitch knots and remove the excess. Step 15: On the other end of the bracelet, remove the stop bead. Weave the tail thread through the beadwork until it exits between the 2B in the first row. Step 16: Repeat Steps 12-14 to attach the other half of your clasp. Check out more easy-to-follow PDF tutorials in the shop! Liked this tutorial? Please share it! You’re welcome, Doris! Glad you like it. I’m glad you like it, Pat!